If a member is subscribed to a specific discussion, he or she will receive email notifications when a new comment is added by anyone involved in the discussion. The member can simply reply or add additional comments via his or her subscribed email address (Outlook, Gmail, Yahoo!, etc.) or alternate email addresses to have comments posted on the discussion. This eliminates the need for subscribers to log in to their iMeet® Central accounts when they wish to be a part of or view any updates in discussions. Each folder in Files & Discussions has an email address available for each discussion. While in a specific folder, select the and choose Email this Folder. A unique email address to start a discussion will appear. Copy and paste the address into your email client or click the Email this address link. You can also email in comments directly to an existing discussion. Simply navigate to your discussion, click on the More drop-down and select Add Email Comments via Email. A unique email address will appear. Copy and paste the address into your email client. 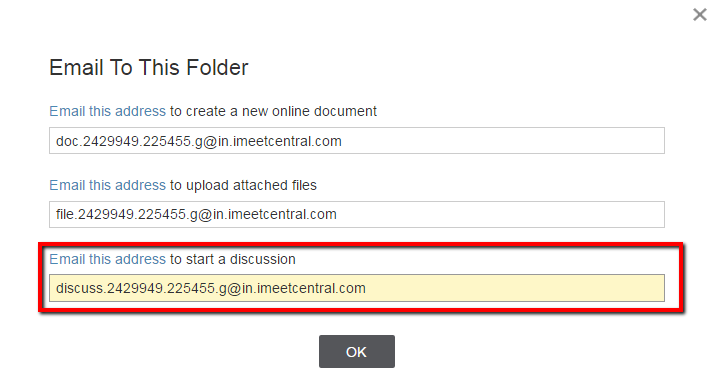 Use the email address referenced above to begin a new discussion within that specific folder. By default, the discussion notice will not be sent to any workspace members when it is started by email. To start a discussion by email and distribute it to other members via email, add [everyone] to the subject line of the email. This will send out a notification email to all members of the workspace, along with subscribing them to the discussion. Comments to the discussion made online or replies to discussion emails will be syndicated to all workspace members. If you wish to change the default setting to subscribe every member of the workspace to a discussion, you can do this by going to the Workspace Settings. To simplify the view of the discussion thread, comments sent in by email are truncated and do not show the complete thread history, as an email would. Only text entered at the top of the “Compose New Message” window will make it into the discussion. Because of this, text entered within the body of a previous email will not be displayed in your comment. To respond to a list of questions from a previous comment, simply copy and paste the desired information into the top of the “Compose” window and enter your response within.